I received this in the mail the other day, I KNEW it was coming but I had no idea what was going to be in it! I love packages like that. It makes the world more exciting. If you don't know what BrandBacker is, it is a website that you can sign up for and work with companies. You HAVE to have a blog and be ACTIVE on it (your blog), you can't just update once a month and call it a day. It's a really neat website where you can pick which brands you want to work with etc. There ARE guidelines that you HAVE to follow as well. 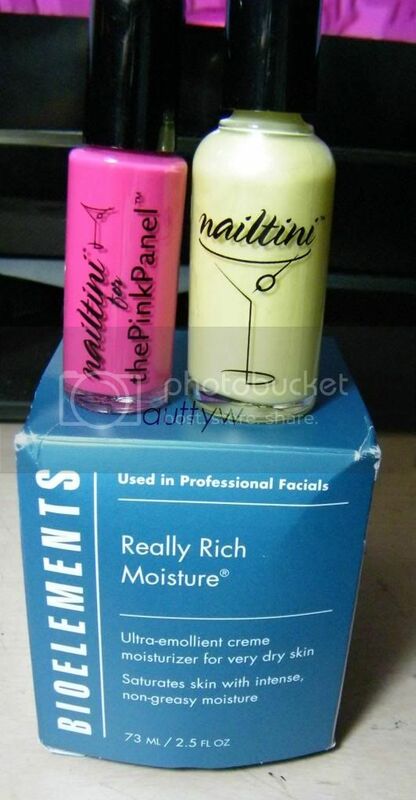 As for what I received from The Pink Panel it was 2 nail polishes from Nailtini and a moisturizer. I was crazy excited about the nail polish, unfortunately regarding the moisturizer I can't use it. It's marketed towards VERY dry skin, and I have oily skin. It stinks, but hey I'm sure I can find someone who can use it!! The Pink Panel is an awesome group of women that I've been a part of TPP with for probably the past year. This is my first time receiving anything from them. The Pink Panel is a community of beauty obsessed women who have a passion of skincare, makeup and all things beautiful. Every woman on the PinkPanel has the opportunity to lend her valuable voice to the ever-evolving world of beauty. PinkPanelists have the ability to not only test/receive/review everything that beauty has to offer, but are oftentimes compensated for doing so! To join the Pink Panel all you have to do is go to www.pinkpanel.com, click join fill out the profile about yourself. Tell them that I sent you and that is it! As an active member you can test the latest beauty products from the best beauty brands in the world before they hit the market. Share your thoughts and experiences. Get rewarded! and you can also talk to other like-minded women! Woo I'm going to sign up! thanks! Fantastic! You are so welcome! It's a really love group of ladies! Thanks I just put the widget on my blog and I'm waiting for them to email me. I never heard of Brandbacker.com I just got that type of polish in my Ipsy bag. Do you like it? Thanks for the follow. I don't remember who told me about Brandbacker, Did you get Mai Tai from the Ipsy bag? I LOVE Nailtini's polishes. They are fantastic. I've got a few and none of them have disappointed me. Yes it's Mai Tai. I got it this month and I have not tried it yet it's been a busy weekend but I plan to do my nails with it soon. I can't wait to try BrandBacker! I got Mai Tai last month. I used it a few posts ago, it's a fantastic color. I pain to photograph color correct but it's gorgeous! Fantastic formula as well!